So I ran across a recipe for a moist (if you know me, you know that word was painful for me to type) cake popular in Sweden called Kladdkaka. Knowing you “ITK’ers”, I knew keeping a straight face when presenting a Kladd-kaka to you would be difficult, so I threw in a little “word salad” and came up with a much less snickering title of, “Swedish Brownie”. Brownie in texture… that dense yet…moist…cake that we know all too well. This beats something called "Kaka", right? Traditionally the Kladdkaka is made with dark chocolate…. This recipe’s play on tradition turned out to be a triumph, and so I thought I would share. Adding the cardamon was my idea, mainly because Swedish deserts, all Scandinavian desserts, love a little cardamon thrown into the mix. The cardamom also tightens the lemon experience, which in turn, showed off the substitution of white chocolate instead of dark chocolate. See guys? There is a method to my madness. 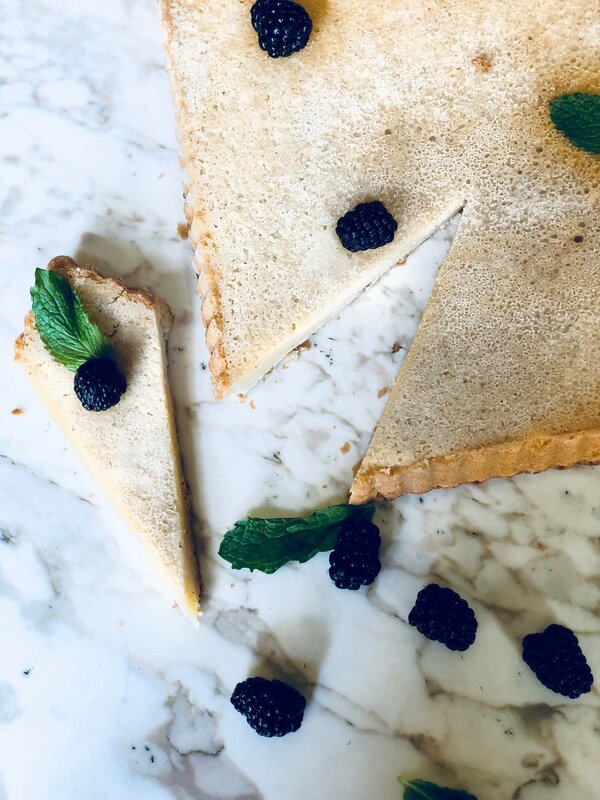 Pair this deliciously rich cake with fresh berries, this spring, to “cut the sweetness”. Blueberries, raspberries, or blackberries work really well. If you’re thinking a more “exotic” fire substitute orange peel (about one tablespoon) instead of lemon, plus a splash of rose water or orange blossom water. Orange loves cardamom and blackberries! Play around with it and let me know what you think. In the mean time I’m going to sit down with a nice slice of Kladdkaka, I mean Swedish Brownies. Scotty out. Preheat your oven to 350 degrees, and spray the inside of a 9” round cake pan or fluted tart pan with baking/cooking oil. Coat the inside with granulated sugar and set aside. In a sauce pot begin melting your butter slowly. Once melted and off the heat and the white chocolate chips. The residual heat from the melted butter will melt the white chocolate. Add the microplaned lemon zest and stir the mixture to a smooth finish. Set aside to cool. In a small bowl combine the flour, salt and ground cardamom. Stir around to combine. In a second bowl combine the eggs and sugar. With your stand mixer or hand-held mixer whip until light and fluffy. You’ll want the egg and sugar mixture light, fluffy, and glossy. Almost like making a chiffon cake batter. Once the eggs and sugar mixture is pale and fluffy fold in the white chocolate, lemon, and butter mixture a little at a time. The idea is to keep the volume of the beaten egg and sugar up, so be careful not to over-mix! Everything added, here on out, will be folded in! Fold the white chocolate and butter to completion. Next, sprinkle a little of the flour mixture on top and begin folding that in as well. Repeat this until all of the dry mixture has been incorporated. 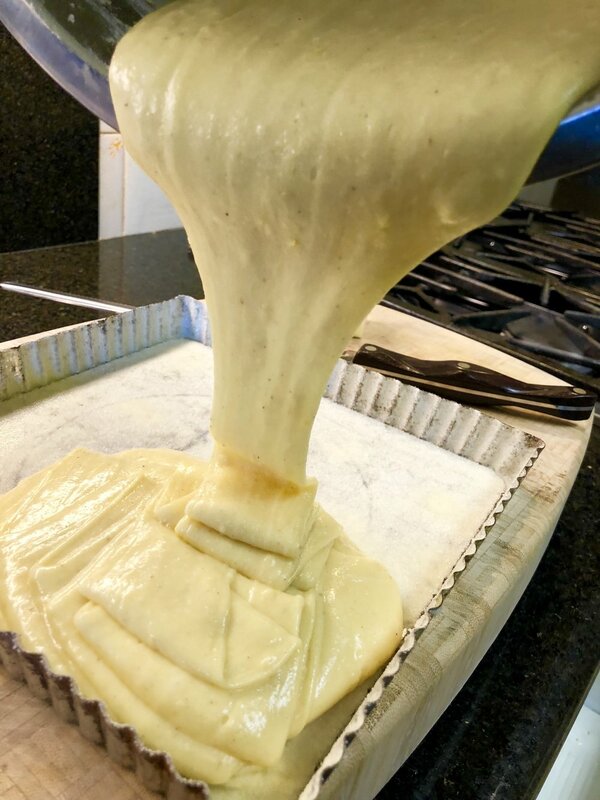 You will notice the batter begins to stiffen up and become viscous… this is an ooey gooey good thing. Pour the batter into your cake pan or tarte pan. Scrape out the bowl well… this stuff is sticky. Smooth out the top and edges evenly, and tap a few times on the counter to release any trapped air bubbles. Place in the oven and bake 20-25 minis depending on your oven, or until the center is just set. Remove the brownie from the oven and cool. Flip out onto a plate or platter, and peel back the parchment paper. Once completely cool and before serving, dust the top lightly with powdered sugar. Serve with fresh berries.